Sud-Ouest face à la piscine, soleil toute la journée. Surmatelas en mousse à mémoire ajoutée sur tous les lits. Il est agréable de revenir à la maison après avoir connu la magie de Disney. Que notre maison soit la vôtre. Cette maison dispose de 2 chambres de maître avec leurs propres salles de bains privées. WIFI GRATUIT, appel gratuit à n'importe où dans les États-Unis ou au Canada. Glenbrook Resort dispose d'un club qui comprend tennis et beach volley, piscine, salle de fitness, salle de jeux, un salon abritant une télévision grand écran, un ordinateur avec accès Internet, et location de films gratuits (dépôt de 10 $ requis). Great property to stay at! We were very happy with our rental of this property. 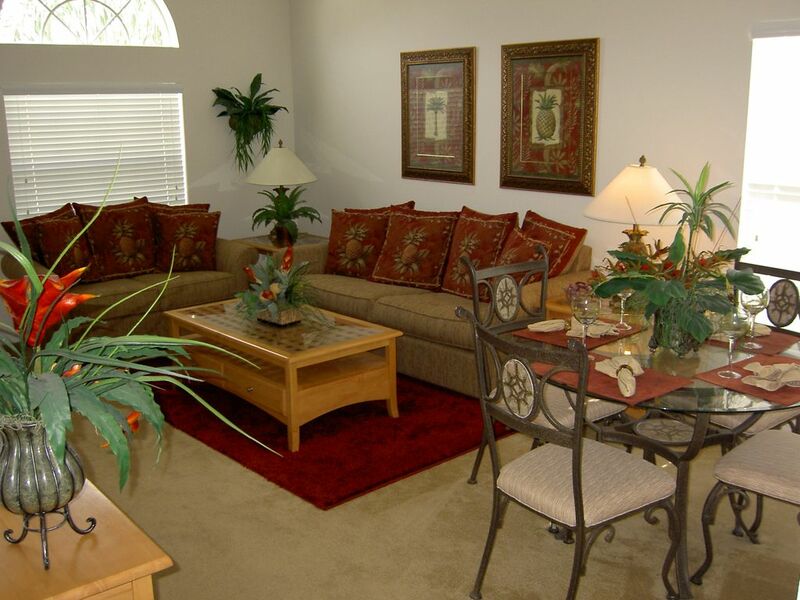 It was located in a quiet neighbourhood, was spacious and had all of the amenities that we needed. The pool and hot tub were great to have and always relaxing after a long day. The location was close to both Disney World and Universal Studios. There is a Publix, Walmart, and Walgreens very close by. The owner was very helpful and answered all of our questions as we had them. We would absolutely rent this property again. We enjoyed this property very much. We enjoyed lounging around the pool. The house was very spacious and well laid out. Our fridge malfunctioned a couple of times but maintenance were very speedy to repair it. The property managers were very helpful as this was our first rental. A very nice neighbourhood with lots to do. Would love a return visit. Nice layout and seperate space to have quiet time. Great home with four bedrooms. Wish King bed was in master with bath and bedroom pool sliders! We chose the king bed master but that was the smallest shower tucked in the middle near kids rooms. It had a pull out couch in the tv living room that we did not try. Our teen got the double sinks in the other master with a queen bed. There were some minor dislikes. Small washer so more loads to do, older coffee maker not cups, no vacuum to clean up or full broom. Not deal breakers. I just like to clean up after my kids as I go. They were locked up. Wish there was more directions on pool/jacuzzi as In how to turn on and off. Took us a bit to understand how to start the blowers on. Loved the HBO channel and tv’s in all rooms! Lots of towels, pillows, and blankets! Wish the solar cover was on pool since the heat seemed to be lost in this weeks cold weather brrrrrr. We paid for heat but It was too cold for me to get in. Kids did not care! Great on the legs and feet though after a long day at the parks! Olga the owner was very nice and helpful and answered all our questions we did ask her. We would stay again! The property was very nice. However, my teenagers were very uoset they couldnt play pool. We wish we had a pool table or sone form of rec room. We were directed to the ckubhouse for pool tables but it didnt have one either! Bummer! Overall, nice place to stay! Great stay for a great price!! Very beautiful home! Our kids really enjoyed the pool! The house was beautiful, well-layed out, and VERY clean. This is one of the nicer homes we have stayed in for the same price. Beautiful home, clean, and spacious. Everyone enjoyed relaxing by the pool after a long day at Disney or the beach. Close to local attractions. Highly recommend to anyone. I would definitely stay here again.